You can pan-fry these, but if you're making many, it's much easier to ust put them on a rimmed baking sheet and bake them instead. Much easier. I didn't measure my spices, just add quite a bit of the white pepper, and just a dash of everything else. You can fry (sorry, for this you'll have to) one to try out the seasoning, but I never bother. And they're always good. You can serve these with anything - potatoes and gravy, macaroni and ketchup, as part of a large smorgasbord, with any vegs, the possibilities are endless. Mix everything to an even batter, and form small, round balls. Put in a large roasting pan, and bake for about 15 minutes at 175°C. (I'm using a convection oven, if you're not, add a few minutes.) Shake the pan a few times to ensure an even surface on your meatballs. ... Or just pan-fry them in butter, on medium-high heat. 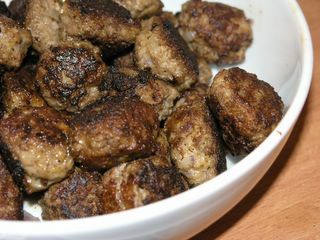 I also usually bake my meatballs - and finish them simmering gently in sauce, I love their texture this way. I like the mixture of spices you added to yours - wonderful! Sally, do you have a recipe I could try? Swedish meatballs, in Sweden, are never served in sauce but it'd be fun to try! Anne, I've been "Swedish" for a few years during Christmas now and served meatballs alongside the more traditional roast. My nephews love them, and so does our daughter (and this year our little big boy). I use a slightly different mix of spices - and like you, I prefer them baked in the oven - they somehow look prettier, and it's less hassle to make.